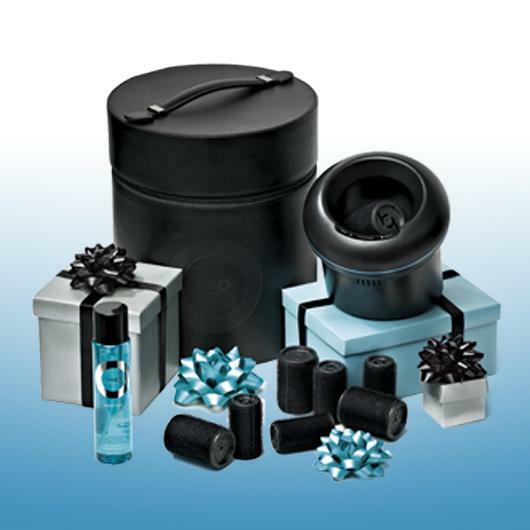 Cloud Nine The O – Gift of Volume. Coming in at a whopping £199, this is an amazing gift. I first saw TheO way back in June, and was astonished at the technology on display. Essentially, TheO is a set of heated rollers, but with a big difference, the round base you see at the back there remains cool, and the rollers are popped into it one by one to heat up, which takes approximately exactly four seconds per roller. I’ve not seen anything like it, and this pack which contains TheO, three sets of rollers (normally bought separately) a carrying case and a bottle of amplifying spray is actually good value. TheO normally retails at £149 alone. I’m actually trialling one of these at the moment, so look out for a full review very soon. I’ve seen this in the flesh, and I think that hands down this is one of the most beautifully packaged gift sets I’ve laid eyes on this year. 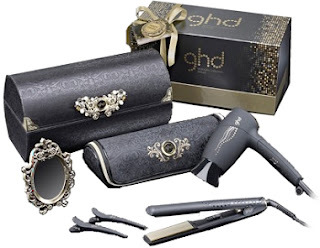 Presented in a gorgeous taffeta-covered trinket box, the set contains a travel hair-dryer, sectioning clips, a gorgeous little mirror, a heat-resistant carry case (which rolls out into a mat during use) for the – also included – new GHD “Gold” styler. This new styler promises smoother gliding over the hair and cooler handles. At a cost of £149, I think anyone would be delighted when unwrapping this, me included! The Fine Print: Again, links provided for information purposes only, and are not affliate links. I really want to try out Cloud Nine stuff, it's meant to be amazing, even more so than ghd? Yeah, i have a pair of their micro irons, and now i never use my GHD's and my hair has never felt healthier!